Being a church-visitor-aholic I have become very aware of the manner in which famous and historic churches treat visitors. For some it it is simply a money making exercise. Other churches see visitors as a chore and there are those who see visitors as their contribution to the local tourist economy. Parallel to these observations is another. Thousands of bemused Japanese and Chinese tourists visit these places extensively – I was tempted to write “religiously”. Most of these visitors know little of what the stories in the windows mean, why there are altars and crosses, who the statues represent and what the other paraphernalia such as baptismal fonts, really mean. So today in Lyon I was greatly encouraged. At the unusual Basilique Notre Dame de Fourviere, perched on a hill overlooking Lyon there were gospel pamphlets for Chinese tourists. 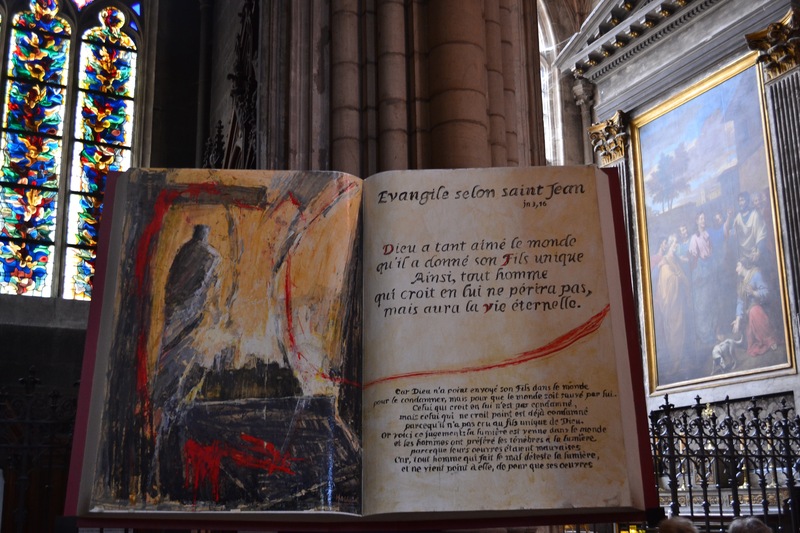 Down the hill at Lyon Cathedral there was a large painting representing an open book quoting John 3:16. This could not be missed as you walked in. My schoolboy French served me well. I even heard a young couple quoting it aloud and being mesmerised by it. I was encouraged because these two churches saw gospel opportunities and did not let them slip. I found the same to be very true in Rome. Lots of non-English speaking tourists who were mesmerized by all that glittered, but the perception of truth was severely lacking. I’m encouraged to know that some take the gospel of Jesus seriously.